On Thursday, 27th May, I’ll give my debut as an solo artists, performing own songs and compositions as well as a live electronic performance. Besides a fantastic band (Maria Finkelmeier, Venla Hinnemo, Leyli Afsahi, Jonathan Börlin, Johan Petterson, Patrick Anderson, Davod Basri, Vanessa Martinez, Johan Bertilsson), the concert will feature Lindie Boström doing lights and visuals and a dance performance by Tore Alsegård. 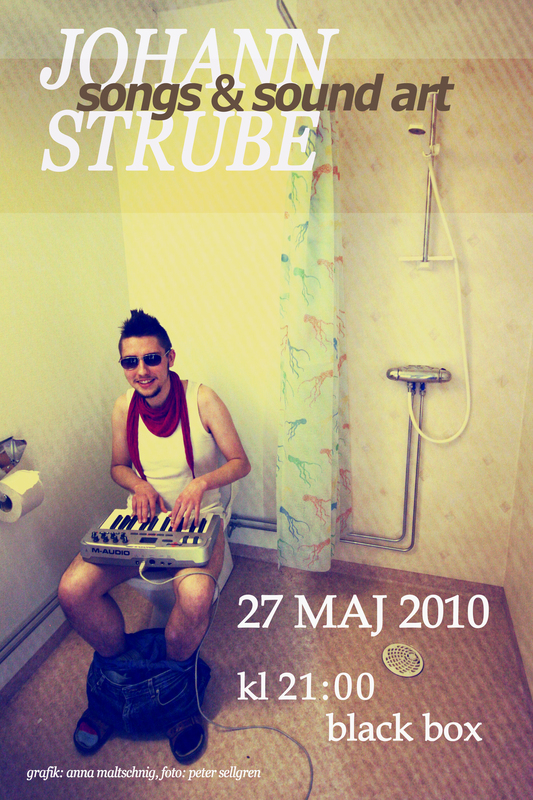 This entry was posted on Thursday, May 13th, 2010 at 12:45 am and is filed under art/kunst, Johann Strube. You can follow any responses to this entry through the RSS 2.0 feed. You can leave a response, or trackback from your own site.